Don’t be fooled by the name, Asics’ update of the recently re-launched Gel-Respector is more Tokyo street style than Memoirs Of A Geisha. Pink and grey has long been a foolproof colour combination, so the new lick of paint may have just turned the Land Of The Rising Sun into country of the comeback kicks. Available 10 March at End, priced £110. Pulling the sneaker equivalent of a surprise album drop, Nike recently announced plans to revive the 1985 Sock Racer. Last seen in 2014, the model that set the high watermark for minimal running shoes features a breathable upper and adjustable straps in the OG black, yellow, and white colourway. Available 11 March at Nike, priced £80. There are dozens of pairs of Nike Air Max that could head up lists of the most ‘grailed’ sneakers of all time, but in reality, they’ve all just been leading up to this. To celebrate three decades of the Air Max 1, Nike has released a mash-up tribute to some of the most iconic colourways over the years. Available 11 March at Size?, priced £120. If the late, great David Bowie was in the market for some new footwear, we’re pretty sure he would have picked Fendi’s latest riff on the luxe tennis shoe. The clean white uppers are finished with a cartoon lightning motif that features across the lace fastening, resulting in sneakers the Starman would have approved of. Available at Harrods, priced £520. When working on a classic silhouette, knowing what to tweak and what to leave well alone is key. 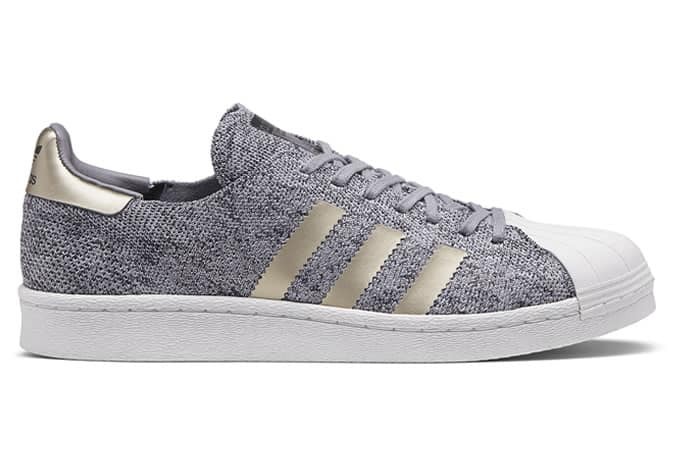 With Adidas’ Noble Metal update, the Superstar’s iconic shell toe is wisely kept clean while the contemporary classics are given a futureproof platinum Primeknit construction and Boost sole technology. Available 10 March at Adidas, priced tbc. Back in 1981, Saucony’s Freedom trainer changed the training game for good. Originally designed for running legends, this patriotic-themed colourway updates the old-school design with cutting-edge features, including the American brand’s Everun foam technology. Available at Saucony, priced £65. As sneakers continue to move off the running track and onto the runway, River Island has upgraded its current output with a range of premium leather high-tops. This earth-tone colourway is finished off with zip and boilerplate detailing for a rough-and-ready design that is one part Zayn Malik, two parts Milan Fashion Week. Available at River Island, priced £80. Believe it or not, spring is on the horizon (no really, it is), so Vans has released the Decay Palms Authentic in preparation. Part of a larger collection, the classic model has gained a botanical redesign with a tropical print added to an inky upper. Available at Vans, priced £50.